The tuning of PID controller by classical technique is a monotonous job and may results in inaccurate system response. 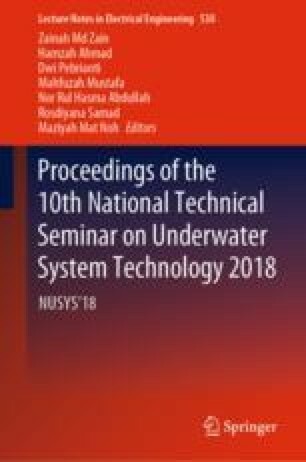 This paper proposes investigations into the development of a model-free PID controller with derivative filter (PIDF) parameter tuning method by using Particle Swarm Optimization (PSO) for depth control of Hovering Autonomous Underwater Vehicle (HAUV). PIDF controller is developed to control the speed of thrusters where 4 PIDF parameters are fine-tuned using PSO algorithms and Sum Absolute Error (SAE) and Sum Square Error (SSE) are chosen as it fitness functions. In order to confirm the design of control scheme, one degree of freedom nonlinear equation of the HAUV system in heave direction is considered. Supremacy of the proposed approach is shown by comparing the results with PID Tuner in Simulink/MATLAB. The performances of the control schemes are accessed in terms of time response specifications of depth tracking capability with the absences of added mass, hydrodynamic drag force, buoyancy force, model nonlinearities, and external disturbances on the HAUV system. Finally, it is seen from the simulation results that the proposed control technique guarantees a fast depth tracking capability. This work was supported by Faculty of Engineering Technology, Universiti Teknikal Malaysia Melaka, especially Robotic, Industrial and Automation (RIA) Research Group under research grant PJP/2018/FTK(10B)/S01610.